Vontae Davis is locked in as the team’s No. 1 cornerback, but there are question marks behind the veteran. 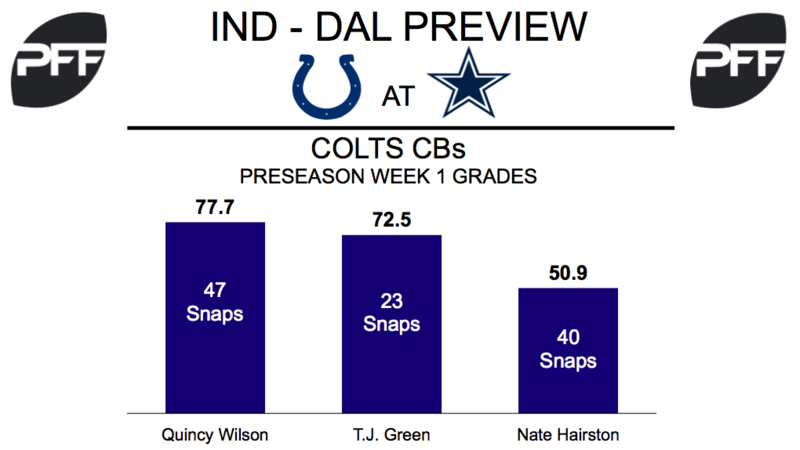 Wilson, the Colts’ rookie second-rounder, has received some first-team reps in practice. The former Florida Gator was targeted on six occasions last week against the Lions, allowing three catches for 41 and a touchdown to Lions rookie Kenny Golladay. Showing his versatility, Green has switched to corner while mixing in with the first-team defense in camp. As a safety in 2016, Green’s 9.5 coverage snaps per reception was the lowest mark at his position. Hairston has had a strong summer to date, and could be in line for a key role as a rookie. Hairston allowed a passer rating of 51.8 during his final year at Temple, fifth lowest in the AAC. Melvin started nine games in 2016, including the final seven contests. Quarterbacks had an 86.6 passer rating when targeting the veteran last season. Troymaine Pope, RB – Pope could find himself in the roster mix after a strong game last week against Detroit. The 2016 undrafted free agent forced three missed tackles on seven rushing attempts, earning a 91.1 elusive rating. Tarell Basham, ED – Basham had a strong preseason debut versus the Lions. He edge rusher earned an 86.5 overall grade (second highest on the team), collecting one pressure and one stop against the run. The third round rookie will once again see significant snaps against the Cowboys. 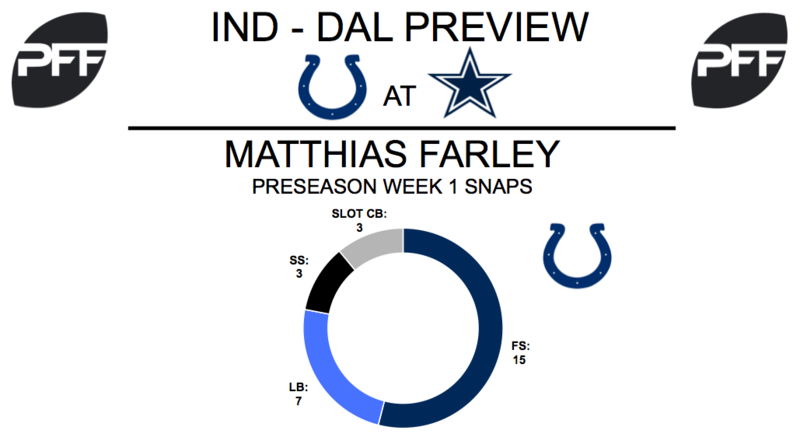 Matthias Farley, S – With Clayton Geathers on the shelf, Farley has received the majority of snaps at strong safety. The versatile defensive back accumulated just 67 snaps for the Cardinals as a rookie, collecting five defensive stops in run defense. Cooper had the first shot at starting at left guard. He earned grades of 41.2 overall in the Hall of Fame game and 46.4 this past week against Los Angeles. His run blocking has been especially poor, even during his 14 snaps at center. Green previously played 189 snaps at left tackle last preseason and filled in while Tyron Smith was hurt in Weeks 3 and 4. Green allowed 13 total pressures last preseason over 105 pass blocking snaps, which ranked him 121st of 137 tackles in pass blocking efficiency (90.2 PBE). Bell, like Cooper, was poor as a run blocker last week (40.7 run blocking grade), he did also allow one QB hurry on 28 pass blocking snaps. His NFL experience at tackle hasn’t been great, over 5100 career regular season snaps his highest-graded season came in 2013 at 72.8 overall. Jourdan Lewis, CB – Dallas doubled up on cornerbacks in the loaded draft class with Lewis and Chidobe Awuzee. Man coverage displays Lewis’ elite ball skills. He broke up 28 passes and intercepted six more on only 182 targets over the last three years. Taco Charlton, ED – After a less than stellar showing in the Hall of Fame game (75.4 overall grade), Charlton racked up a sack and two stops against Los Angeles. He also had three plays where he beat his lineman but the ball was thrown too quickly to earn a pressure (82.9 overall grade). 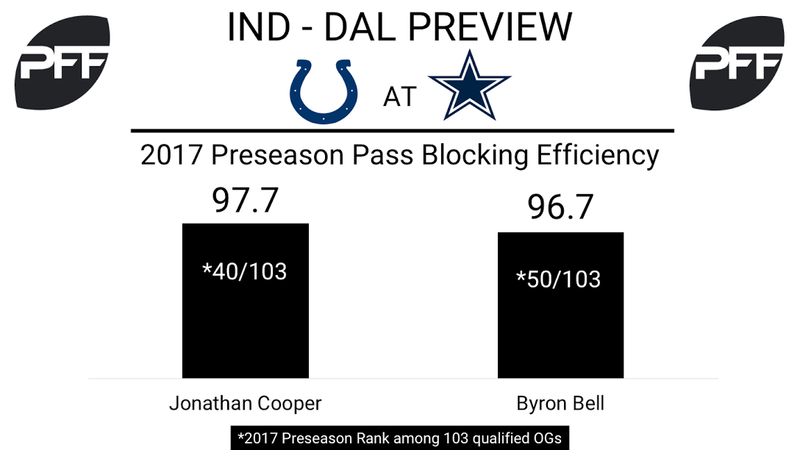 Jaylon Smith, LB – One of the best linebacker prospects a year ago looks to finally make his NFL debut. Smith had the second-highest pass-rushing productivity (19.2) in the draft class his junior season before declaring early. He can cover backs and tight ends as well; 22 percent of his snaps came outside the tackles.